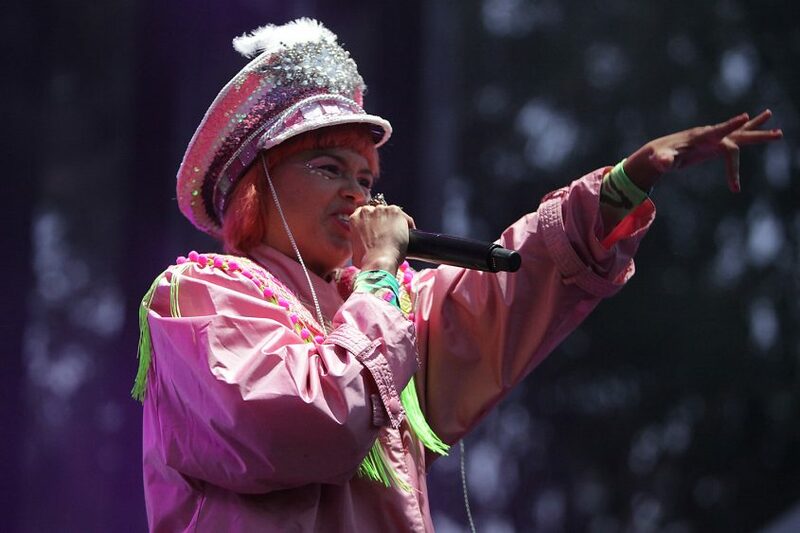 Outside Lands kicked off its second day of music, art and cuisine under an overcast sky; festival-goers were unperturbed, however, and fans flocked to Golden Gate Park in droves to experience everything Day 2 had to offer. 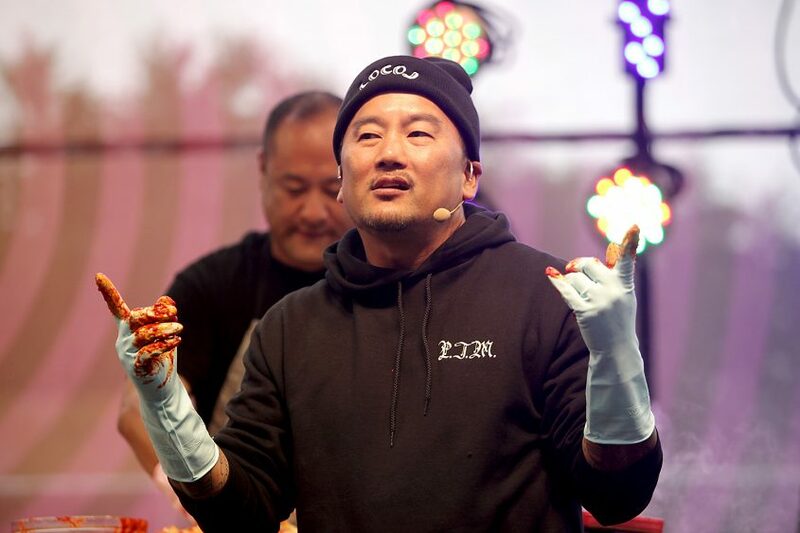 L.A. chef Roy Choi, known for putting Korean-barbecue tacos on the map, served up a step-by-step tutorial on making kimchi Saturday afternoon at the Gastromagic stage. The owner of east Oakland’s LocoL Bakery drew in San Francisco foodies of all stripes with a little help from friends Dan the Automator and Del Funky Homosapien. Chef Roy Choi talks with the crowd during a cooking demo at the Outside Lands Music Festival at Golden Gate Park in San Francisco, Calif., on Saturday, August 12, 2017. 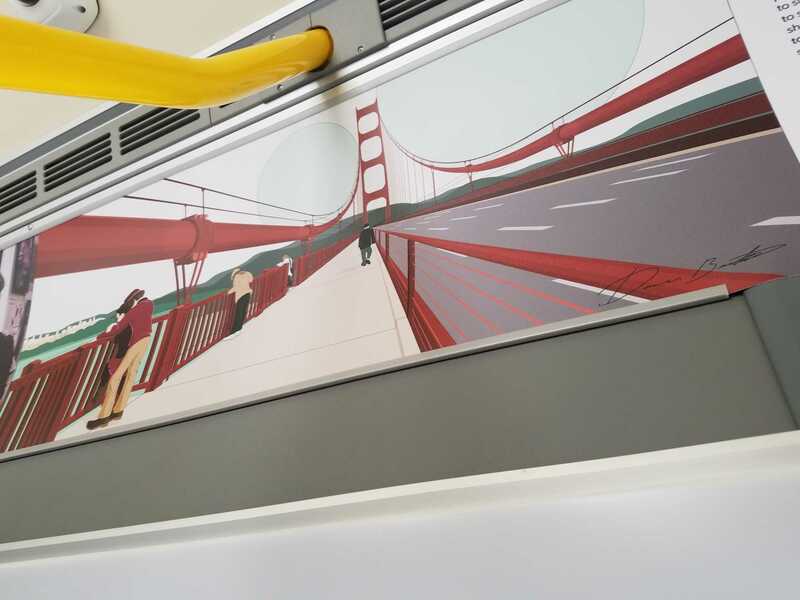 Upon completion, the chef opted to give Saturday’s creation to an audience member and urged him to bury it somewhere in Golden Gate Park so that it could be recovered at next year’s festival. Choi continued to serve food to onlookers as Del Funky Homosapien and Dan the Automator took the stage for a brief performance. Outside Lands mascot Ranger Dave stopped by the Gastromagic stage during their act to show off some dance moves. Also making an appearance Saturday afternoon was Jeff Goldblum and the Mildred Snitzer Orchestra, on the Barbary Stage. Unlike other stages at Outside Lands, the Barbary is an actual structure providing an indoor stage that offers the appropriate feeling for the comedy and improv that primarily occurs there. Naturally, it was the perfect place for a jazz act. Goldblum tickled the ivories backed by 2 saxophonists, a standup bassist and an electric guitarist. The group was also briefly joined by jazz singer and stage actress Annie Ellicott. 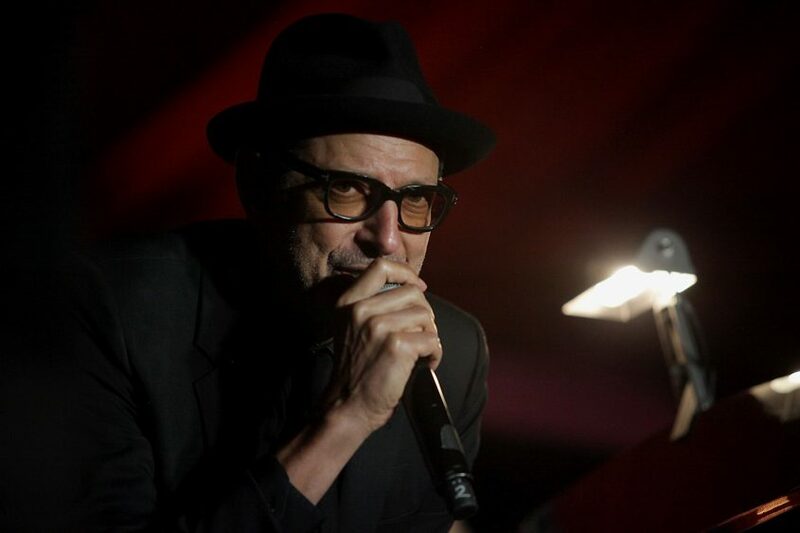 Jeff Goldblum and the Mildred Snitzer Orchestra perform at the Outside Lands Music Festival at Golden Gate Park in San Francisco, Calif., on Saturday, August 12, 2017. 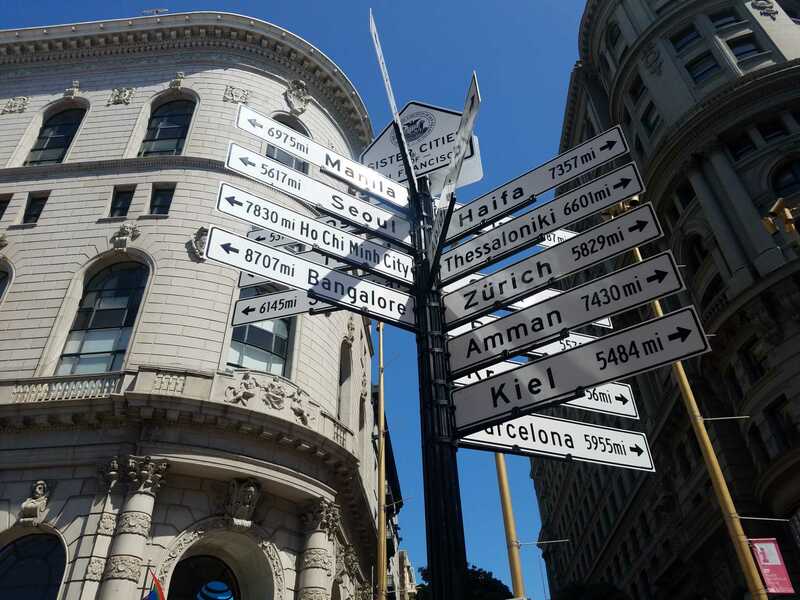 Between numbers, Goldblum quizzed the audience with trivia like “name that San Francisco establishment with a pun in its name.” Answers included the dog hotel Embarkadero Social Club, and the now defunct Union Square stationery store, Avante Card. Late afternoon saw the melodic Los Angeles indie rock band Warpaint take the Lands End stage. The smoke machines were working overtime for their set which seemed to mirror the overcast, foggy feel of the day. 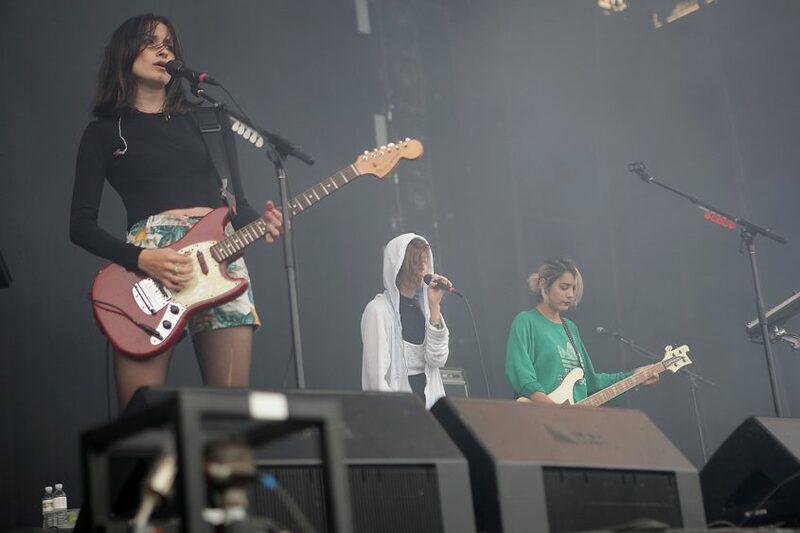 Warpaint performs at the Outside Lands Music Festival at Golden Gate Park in San Francisco, Calif., on Saturday, August 12, 2017. Lands End felt a little big for the all-female quartet, and while the heavy smoke filled up some of the blank space, there was a distinct emptiness onstage. 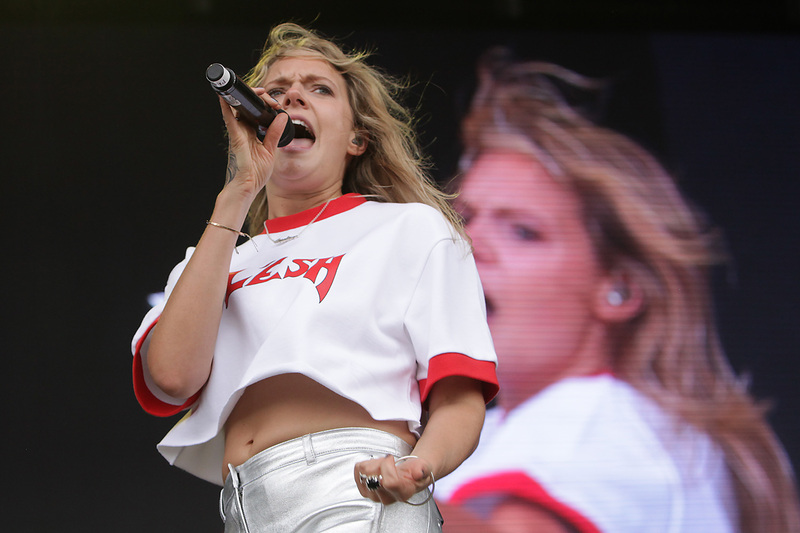 They were bunched up in the middle and excepting front woman Emily Kokal, they were more or less glued in place, so the larger-than-life stage made them look tiny. Their sound and their stage presence may have been better suited to Sutro or the Panhandle, but they did draw a respectable crowd, all things considered. 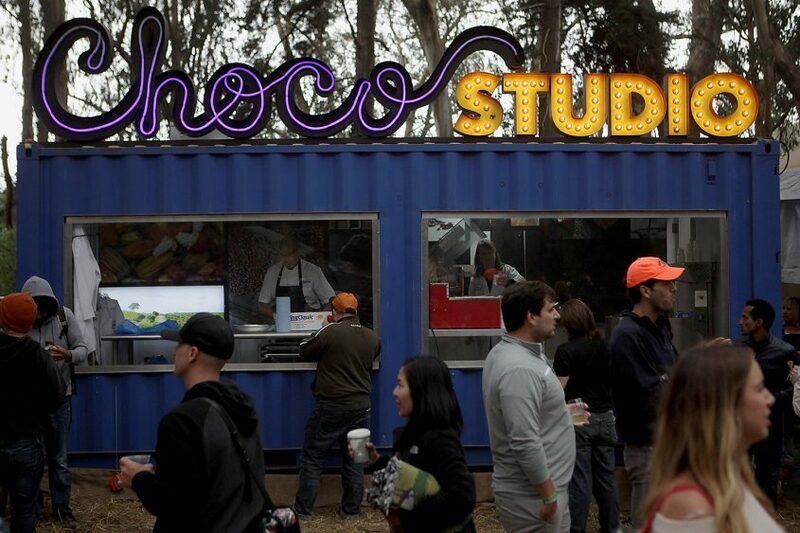 SFBay had the chance to check out Choco Land, a section of Outside Lands dedicated to chocolate lovers and sugar comas alike. The dessert offerings there include gourmet cupcakes, chocolate covered rice krispies, hot chocolate and much more. Guests stroll into Choco Lands for some sweet treats at the Outside Lands Music Festival at Golden Gate Park in San Francisco, Calif., on Saturday, August 12, 2017. We decided to go for the option that seemed most exotic — Guittard’s melted chocolate bar. Aside from the obvious, we were curious what this treat even was. It turns out it’s amazing. Imagine that chocolate bar you accidentally left in your car on a hot day, only in a cup, and you can eat it without getting chocolate all over yourself. It’s that, only more delicious. The chocolate is roasted at Guittard’s home base in Burlingame, but at Choco Land they offer a window into their chocolate craft as it’s being melted down. You have a choice between milk or dark chocolate, and you can also choose toppings like toffee bits, almonds, chocolate chips or cocoa nibs to go into your melty delicacy. We tried dark chocolate with toffee bits and cocoa nibs, and it was out-of-control delicious. We found out cocoa nibs are the meat of the cocoa bean before it’s roasted, and along with the toffee bits they added a nice crunch. Later in the day we stopped by San Francisco’s Rosamunde Sausage Grill for some poutine. To those unfamiliar with it, poutine is basically french fries with all sorts of mouth watering, savory goodness piled on top. We got poutine with vegan apple sage sausage, gravy and cheese curds, and it was beyond guilty pleasure. The servings are easily enough for three or four people which definitely warranted a disclaimer of some kind, as the guilt ended up bleeding over into feeling sorry we had to throw away so much perfectly delicious food. After we shook our food coma we fought our way through a dense crowd down to the Lands End stage to catch Cage the Elephant. Frontman Matthew Shulz appeared strutting up and down the stage in a leopard print coat that he later shed in favor of no shirt, with the entire Polo Field pushing and stumbling to get a better look. 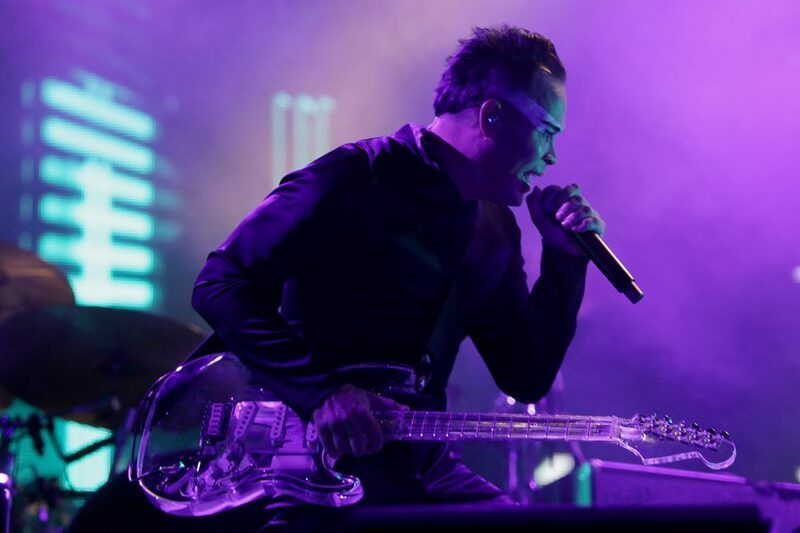 As his image played across the black and white screens on either side of Lands Ends he went all in, pacing and gesturing and generally pouring his heart out to fans. Midway through CTG many people headed in the direction of the Twin Peaks stage with the goal of seeing the highly anticipated A Tribe Called Quest performance, but in a stunning upset, it was not to be. The festival quickly slotted Claude VonStroke in ATCQ’s place, but it did nothing to halt the stampede of disappointed Outside Landers who had turned tail from Twin Peaks in search of a salve for their disillusionment. 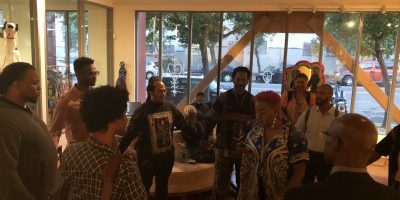 On Friday, fans were told that Tribe had been canceled due to traveling issues but, as of this writing, neither Outside Lands nor ATCQ have provided an explanation for the group’s absence, much to the dismay of many outraged fans. Another much awaited band who actually did show up Saturday night was Metallica. The pioneering metal band has been around for over 35 years and, unsurprisingly, they drew a vast ocean of festival-goers at Lands End. 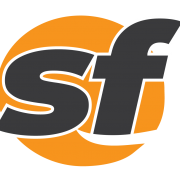 Despite multiple requests, SFBay was denied photo credentials for Metallica at Outside Lands. We regret we can make no images available of their performance. Present was a wide spectrum of diehard fans, the youngest of whom represented a pulsing mass nearer to the stage, while older fans were content to view the show from further distances around the Polo Field. Meanwhile across the park, psychedelic cumbia band Bomba Estéreo was rocking out on the Panhandle stage. Bomba Estereo performs at the Outside Lands Music Festival at Golden Gate Park in San Francisco, Calif., on Saturday, August 12, 2017. Front woman Liliana “Li” Samuet was pretty in pink with a long coat and a short bob haircut, both the color of bubblegum. She danced around the stage encouraging the masses to clap and jump up and down to the band’s pounding rhythms. CORRECTION An earlier version of this story misidentified the vocalist of Bomba Estéreo. 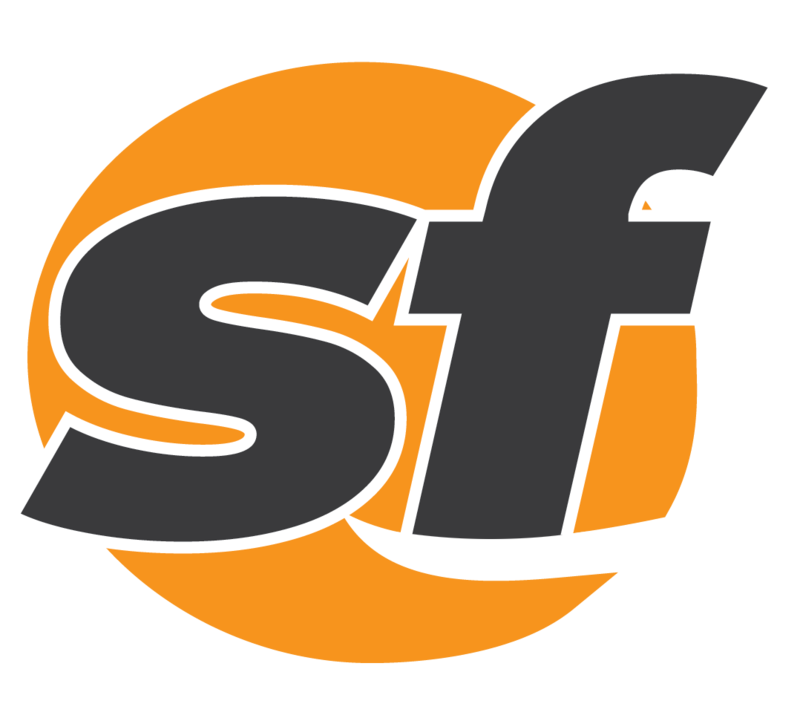 SFBay regrets the error. As Samuet was blowing kisses in a farewell to the crowd, the electronica duo Empire of the Sun took up the stage at the nearby Twin Peaks. The crowd they amassed was monstrous and it eventually spread so far as to begin creeping toward the now vacated Panhandle. Empire of the Sun performs at the Outside Lands Music Festival at Golden Gate Park in San Francisco, Calif., on Saturday, August 12, 2017. Appearing in intricate electric blue sequined costumes with detailed headdresses and a routine deeply choreographed, the group was a crowd pleaser. Many fans sported glow sticks and various lights that they held as they danced to make hypnotizing light swirls, not dissimilar from those occurring onstage. 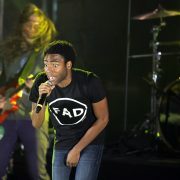 The band made a costume change before launching into a song that everyone seemed to know the words to. Empire of the Sun’s ability to overload the senses in combination with the sheer volume of people cloistered in the relatively small space was simply dizzying. SFBay scampered away before the show ended to re-direct back out to the less claustrophobic Polo Field where Metallica’s extended set was still going on, in an effort to edge our way towards the exit before everyone else got the same idea.